Have you heard of LTO (Linear Tape-Open) drives? Hi there, this is Tamaki (@r_ralph_h) from the LINE Android app development team. I’d like to share my tryout on LTO drives with you, which is not commonly known by the general population of consumers. The official name of LTO is Linear Tape-Open which is a magnetic tape storage technology. Audio cassette tapes, VHS (Video Home System) and 8mm video tapes are all a type of magnetic tape storage. The cost of tape media is relatively low considering the amount of data they store. LTO drives are especially strong in terms of its life span; you can keep data on LTO drives up to 20 years if kept in the optimal temperature and humidity. LTO drives are mainly used by businesses thus to set up something with the latest version of LTO drives would probably cost you around tens of thousands of dollars. Every two to three years a new version is released. Higher the number suffix the latest it is. For example, LTO-1 is the oldest. The latest one as of December 2018 is LTO-8 released in 2017, which supports up to 12TB of storage (up to 30TB when compressed). Higher the specification, bigger the storage, faster the read or write operations and more features such as cryptography and LTFS are introduced. As far as compatibility is concerned, reading and writing is supported within one generation. LTO-7 supports reading up to two younger generations. One of my hobbies is taking pictures. As time passed, I ended up with stacks of film data and lack of storage. The options I checked out are commonly used HDD, optical devices like Blu-ray and various cloud storages, but I decided I wanted to try out something different. Coincidentally, one of my friends introduced me to LTO drives, so after doing a bit of research myself, I decided to go with an LTO drive. The specification I chose was LTO-5. LTFS (Linear Tape File System) was introduced in LTO-5 and they can be used similarly to general media types like flash drives. As long as you don’t use LTFS, the specifications lower than LTO-4 or higher than LTO-5 can be used with the commands; mt for tape controlling and tar for read and write operations for recording. By the way, I learned it this time that tarstands for Tape ARchives, and that it is intended for tapes initially. You can’t buy new LTO drives from the market; you can buy one from data centers or used ones from second hand markets like Auction. 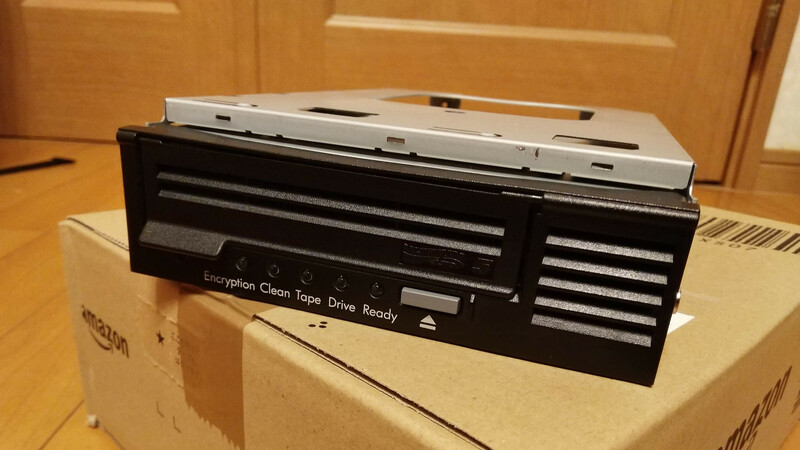 You can buy LTO-5 drives around $500 these days. Assembling a PC with an LTO drive is similar to setting up any other PC. The model I bought is Ultrium 3000 BRSLA-0904-DC from Hewlett Packard. This model fits in an 5.25 inch bay, so you can install it like an optical drive. However, its depth is about 10cm longer than ordinary optical drives, so in some cases you may not be able to fit it in. Since this model is an SAS-based (Serial Attached SCSI) device, you may have to prepare an HBA (Host Bus Adapter) or a motherboard that supports SAS HBA internally. In my case, I used an SAS card from HP, HP LSI SAS 9212-4i. This has four internal SATA (Serial AT Attachment) connectors. Although there are SAS cards that come with SFF-8087 connectors (Mini SAS internal connector, 4 channels per connector), if you connect all four SAS devices with a cable, the cable becomes quite thick. So, I chose the one with SATA connectors. SFF-8482 connectors are often used in LTO drives. Although the connectors which are usually used by SAS HDDS have a single connector for both data and power, you can convert the SFF-8482 connector to a SATA data cable and SATA power cable using a special adaptor. So, using SATA SAS cards is much more convenient because you only need to attach the required number of cards. The picture on the left is a desktop before attaching an LTO drive, and the right one shows the LTO drive assembled. The OS (Operation System) I installed was Windows 10 Pro. Windows these days supports devices only by itself, with its preloaded drivers. I was able to use my LTO drive without installing any additional drivers. 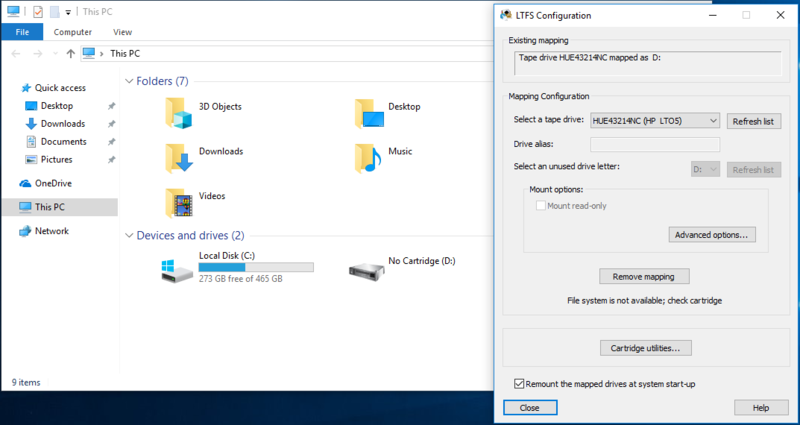 If you can see the LTO drive on Windows, you are ready to use commands like mt. Since I chose LTO-5 for LTFS, I wanted to try out LTFS instead. But to use LTFS, you need to install additional software provided by the drive vendor. You can see the list of software by vendor here. My model, Ultrium 3000 BRSLA-0904-DC, requires the HP StoreOpen Standalone to be installed. 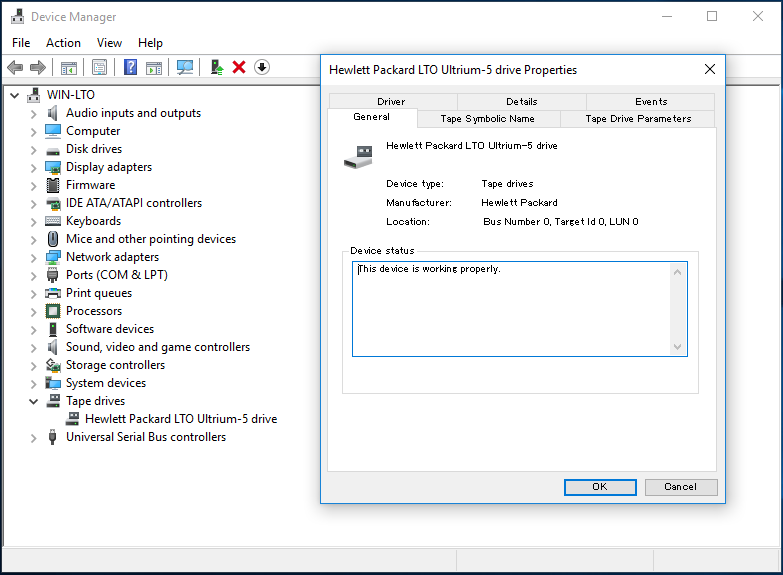 Once the program is installed, on the LTFS configuration window, assign a drive letter and set an LTO cartridge, then you are ready to use it like ordinary drives. LTO drives tend to be weak at random connections. When you overwrite an existing file on LTFS, the memory where the old file is gets marked as unavailable for use, and the new file is written in a new region. So, basically, there is no overwriting. If the new file is larger than the original one, instead of consuming extra memory for the extra size, we will be occupying as much as the size of the new file. If the new file is smaller than the original one, we won’t end up saving memory. So, LTO is recommended for storing data you are not going to rewrite. Second hand LTO drives are pricey, but LTO-5 cartridges are not so; they cost only about $30. Having to prepare specific devices for installment can be a fuss, but it is strong against shakingcompared to HDD. Considering the average price of 4TB HDD being around $80, purchasing 1.5TB cartridges can become expensive. Despite the price, it was quite a pleasantry experience for me, having a try on tape type media with that sound of it running.